Everyone knows quick and fast are not the same attributes. You can be quick, but not fast. Or, you can be fast, but not quick. Guest Blogger Brian Schofield submitted this article called Basic Basketball Drills. I thought it was worth posting with the nasty winter weather we are having on the west coast, and the lack (or, should I say non-existent) of indoor track facilities. Sometimes a change of pace is good for athletes to prevent them from getting stale, and these drills will help your quickness. 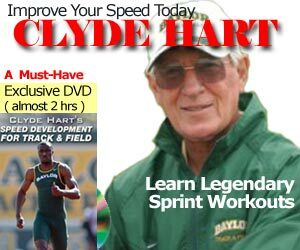 It may even help your 40 yard dash. This is actually easier to do than to explain but I’ll give it my best effort. Make sure that you spread your legs apart and bend at the waist. Put the ball through your legs, around one leg, back through your legs, and around your other leg, making a figure eight. I had to read that a couple times to make sure I explained it correctly. I will tell younger players that it is ok if you put your head down and watch the ball at first. But once you get the feel for the ball then look up and don’t watch the ball. This will help with your coordination and give you a better comfort level with the ball. Try to go as fast as possible. When you are really in a groove with this you will notice yourself swaying from side to side and getting tired. We called it head, shoulders, knees and toes when I was little but that is a ridiculous name so later, when I saw another coach call it around the world, we changed it. This basketball drill is one of the staples of ball handling. It is done by taking the ball in a circle around your head, waist and legs. Your legs should be together while doing this basketball drill. Once you go around your legs on the bottom, spread your legs apart and go around each one individually. Then put your legs together again and start from the bottom up and do it all over again. Around the world is a much better name. If you are a coach using this basketball drill for your players just make sure they are doing the basketball drill correctly and not just speeding through it. Stress the importance of perfect practice as compared to going through the motions. We called this basketball drill suicide because of the incredible risk of great pain for us. Girls do this basketball drill fearlessly, but I seemed to always be a little scared about doing it. I got better at it over time, but still very scary. All you do here is take the ball with two hands and hold it out in front of you. Spread your legs about shoulder width apart and bend at the knees a bit. Not much though. Bounce the ball between your legs and catch it on the other side. Now you understand why I call this basketball drill suicide. The ball has a tendency not to make it all the way through and can cause some pain. The basketball drill isn’t pointless as it will really help with the understanding of ball speed and bounce. It truly will increase your awareness and concentration. Have some ice handy and have fun. @John – yes, I remember those as well. They left my legs kind of “wobbly” at the end of the workout. I like the suicide basketball drill. I have not heard of that one. thanks!